Earthy beets and tangy grapefruit pair perfectly with briny capers and a sweet-savory balsamic reduction in this winter salad. Wash the beets, then wrap them tightly in foil. Set them on a baking sheet and roast until tender, about 30-40 minutes. Let cool in the foil. Unwrap, peel and cut them into small wedges. Meanwhile, in a small saute pan, heat the balsamic vinegar over low heat. Simmer until reduced by half, about 15 minutes. Whisk in brown sugar and continue to simmer until it is thickened about 5 more minutes. Let cool and set aside. Slice and segment all the grapefruits (remove the white pithy "skin"). 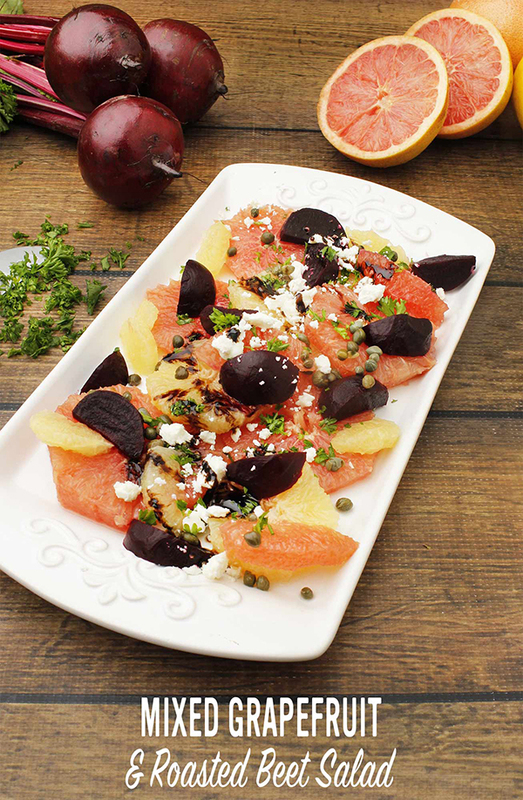 Place the grapefruits on a platter with the beets and sprinkle the parsley and capers over the top. Drizzle with olive oil and the balsamic vinegar reduction. Season with salt and pepper. Top with crumbled feta cheese (optional).